5m S-Video / SVHS high quality video cable, fully shielded high definition oxygen free copper cable, attractive silver finish connectors with gold plated contacts. 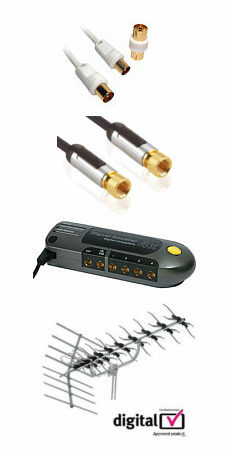 5m 2 x phono to 3.5mm stereo audio cable for connection between sound card and scart adapter. OFC Cable, metal body connectors with gold plated contacts. 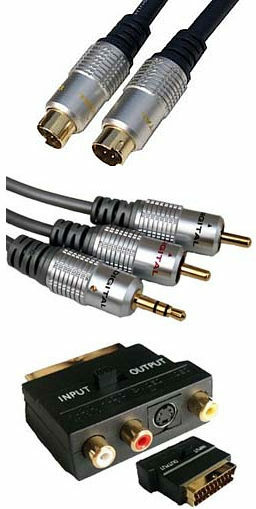 Scart adapter with gold plated contacts, connectors for s-video, composite video, left and right audio. In order to get a colour picture from your PC your scart input must be s-video compatible. If you scart is not s-video compatible then you will need an s-video to composite adapter, SKU AD006. USB 2.0 type B to micro A male for use with many portable devices, please note this is not compatible with the USB mini B connectors. The KVM-DV02 will allow two IBM compatible computers to be controlled from one keyboard, one mouse and one DVI monitor. Switching between computers is as easy as pressing the button on the front of the switch or by entering a hot-key command from your keyboard, no interface card or software is required, the switch is independent of operating systems, and allows the attached computers to run different applications.